What is the Seminar and Lecture Notes Feature? 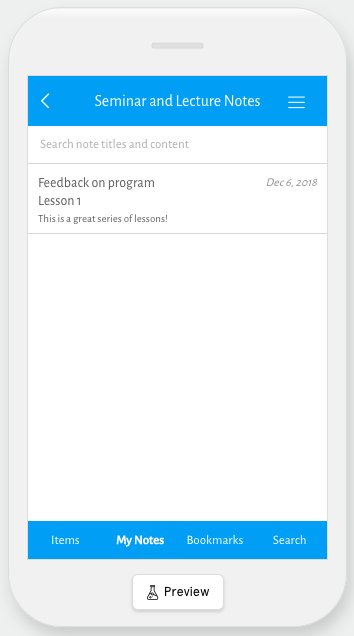 The Seminar and Lecture Notes Feature is a great way to share seminars, lectures, and sermons with your users and allows them to add their own notes to those presentations. In this article we’ll go over the main functions of the feature, and how to set it up. What are some use cases of Seminar and Lecture Notes Feature? What are the Seminar and Lecture Notes Feature’s primary functions and what are the steps to accomplish them? The Seminar and Lecture Notes Feature was made for all types of seminars and presentations in mind, including but not limited to: lectures, classes, sermons, conference presentations, internal company presentations just to name a few. Now we’ll go over how to set up the Seminar and Lecture Notes feature. When you first create a Seminar and Lecture Notes feature, it will be empty. 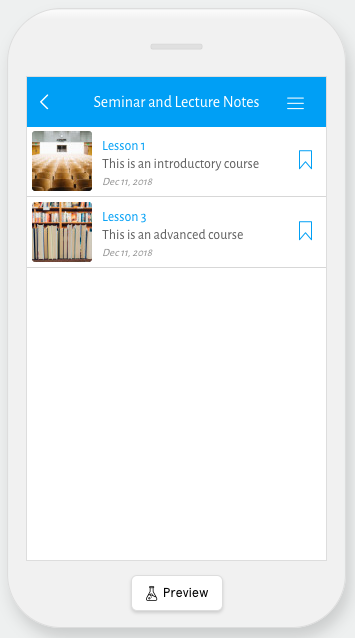 To add seminar or lectures to the feature, you’ll need to create what’s known as an item. 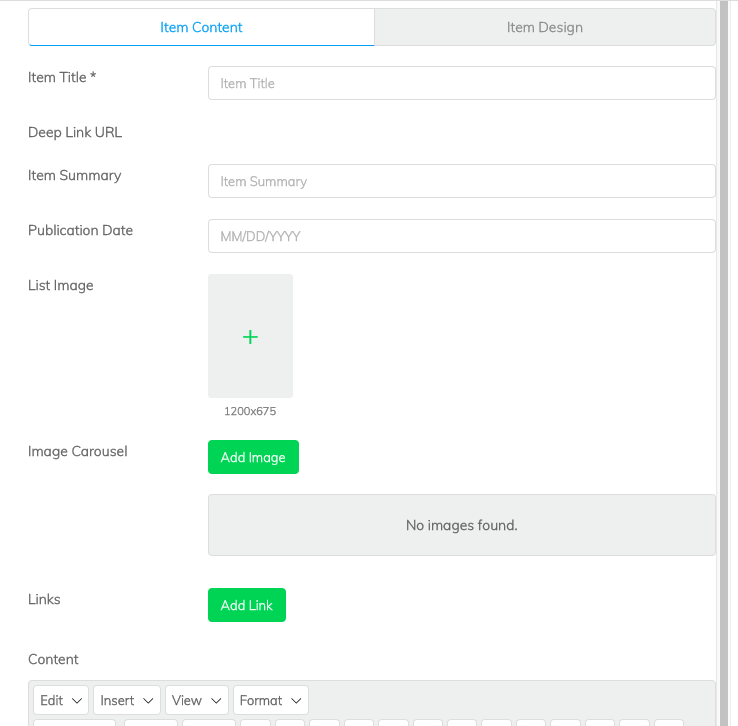 But before you do, you may want to add some images to the Image Carousel and some content to the Text WYSIWYG Editor that is included in the feature. This can help inform users of what content in housed within the feature and is a great way to add uniqueness to the look of this part of your app. Adding content to these is completely optional, but it can be a great way to add additional information about the presentations in this feature. Next we’ll go over how to add an item. An item is what allows you to link users to a seminar or a lecture, and it allows them to add notes to items which they can revisit at a later time. Users are also able to bookmark items, which we’ll go over the notes and bookmarks process later in this article. To begin creating an item, click Add New Item. Keep in mind that one item equates to one lecture or seminar. Clicking this will take you to the Item Content tab. Once you’re in the Item Content tab, start by giving your item a title in the “Item Title” box. We also recommend that you include and Item Summary as this will display under the item’s title and may help clarify what that item is for users of your app. Note: you can also include a publication date, but this is entirely optional along with the Item Summary. Now that you’ve given the Item a title, you’ll want to upload a List Image for the item. This can help differentiate the seminar or lecture from other ones in the feature. This is perfect for if you have different series of seminars with different images associated with them. To upload a List Image, click on the gray box next to “List Image’. We recommend that you use an image that’s 1200 px x 675 px. 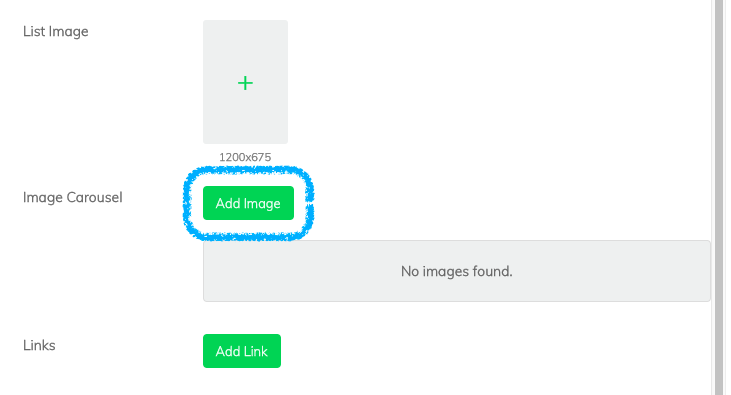 Clicking that will bring up the Media Library where you can either upload a new image or use a previously uploaded image. This is optional, but we recommend that you add an image, or images to the item’s Image Carousel. Not only does this make the item look nicer, but it allows you to add an action to the image with our Action Builder. 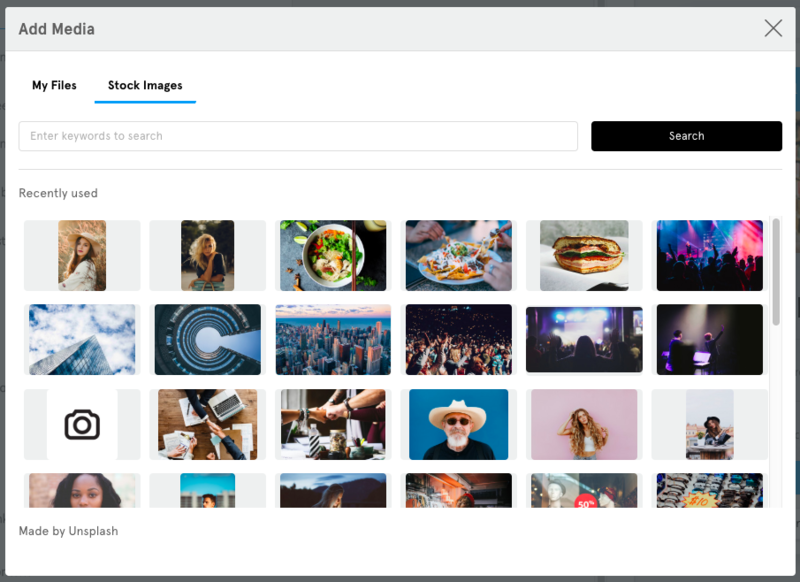 To add an image to the Image Carousel click on “Add Image” which will bring up the Media Library so that you can upload a new image or use a previously uploaded one. 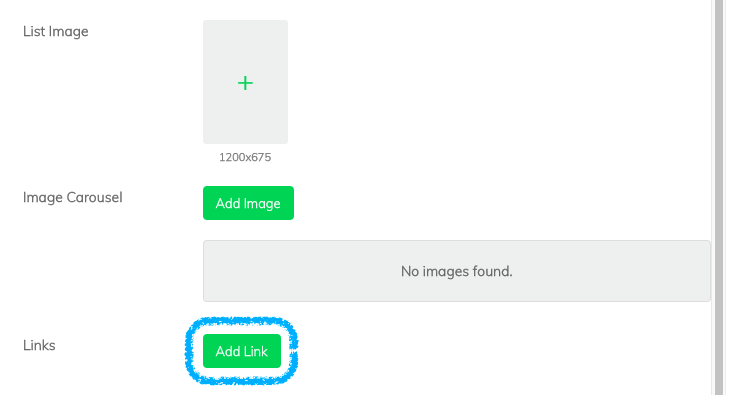 You can also add links to content by clicking on “Add Link” which will open up our Action Builder. Doing this will add a prompt called “Open Menu Options” in the Item. Both of these are great ways to link users to outside content such as videos, presentation slides, and other content related to that item. This is optional, but we recommend that you also add in content to the Text WYSIWYG Editor of the Item. This is a great way to add additional information or context for the item. You can include talking points or a summary of the presentation in that Item. If you would like to give your Item a background image, you can do so by clicking on “Item Design” then on the gray Background Image box. 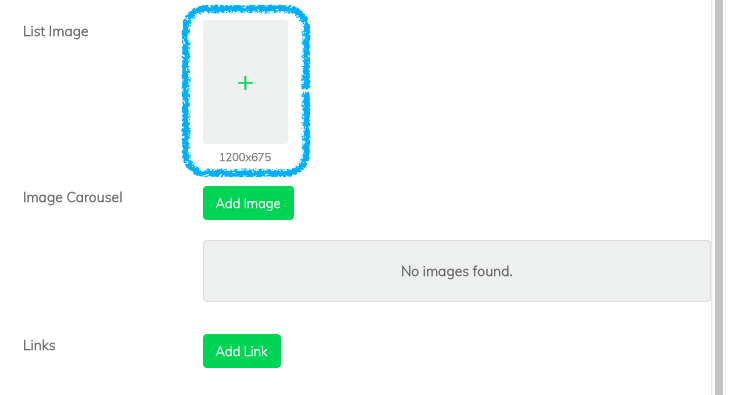 This will bring up the Media Library so that you can upload a new image or use a previously uploaded one. We recommend using an image that’s 750 px x 1334 px. We recommend that you use an image that’s 750 px x 1334 px, and one that’s not too busy as it can interfere with the legibility of the Image’s text. You can set up a different background image for each Item. Once you’re finished with setting up the Item, go ahead and click “Done” to add it to the Seminar and Lecture Notes feature. Congratulations! 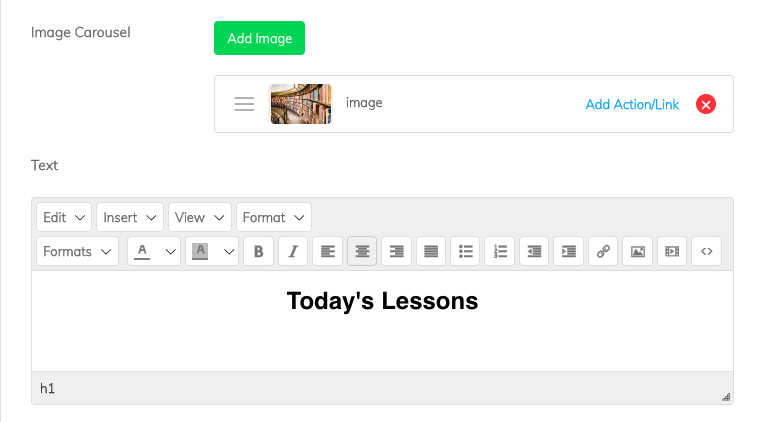 You’ve added your first (hopefully of many) items to the Seminar and Lecture Notes feature! Once you’ve added multiple features you can change their order by using the “Sort” drop-down menu where we have a number of options for how to sort your feature’s items. 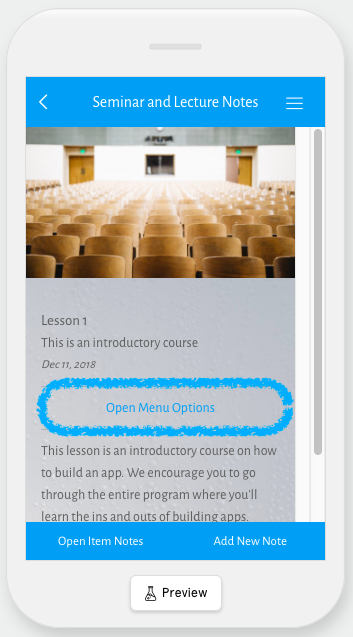 Next we’ll go over the different options your app’s users have while using the Seminar and Lecture Notes feature. 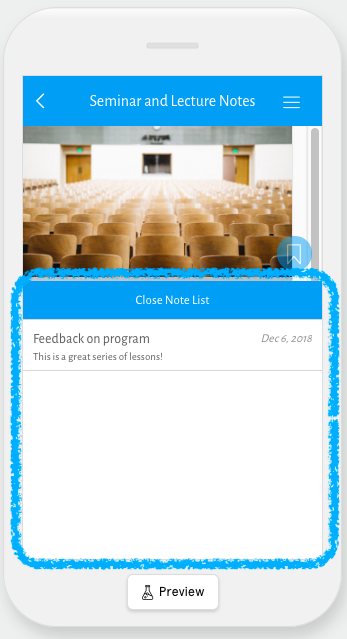 Once you’ve begun adding items to the Seminar and Lecture Notes users in your app can bookmark their favorite items, add notes to items, and search throughout the items in the feature. Note: In order for users to add notes to an item, they will need to have an in-app profile and be signed-in to it. 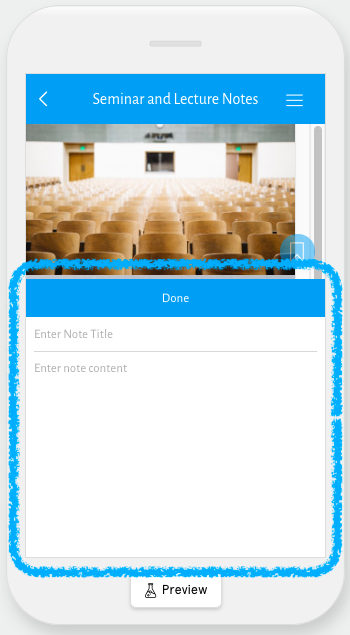 This allows the app to track their notes so that they can return to their notes and manage them. When a user wants to add a note to an item, they will first need to tap on that item. Next they’ll select either “Open Item Notes” to see all of the notes that they’ve already added to an item, or “Add New Note” to add a new note to that item. If they select “Open Item Notes” they can view and edit all of the previous notes that they’ve added to that item. If they select “Add New Note” a prompt will appear that will allow them to add a new note to that item. Once they’re finished, they just need to tap “done”. This note will automatically save for them. Congratulations! 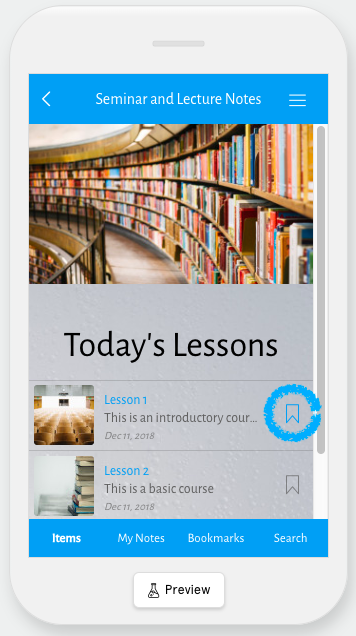 Now your users can add their own notes to the seminars and lectures in your app! If they ever want to access all of their notes, all they need to do is select “My Notes” in the bottom menu. To bookmark an item, all a user needs to do is tap on the bookmark icon next to an item. Once an item has been bookmarked, users can easily go back to it by tapping on “Bookmarks” in the bottom menu. This will take them to a list of all the items they’ve bookmarked. 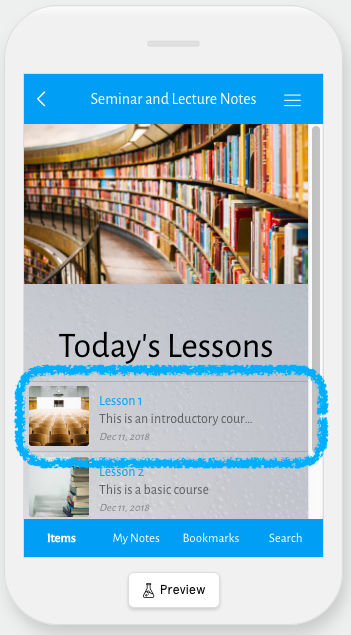 Users can also search through the items in your Seminar and Lecture Notes feature by tapping on “Search” in the bottom menu. 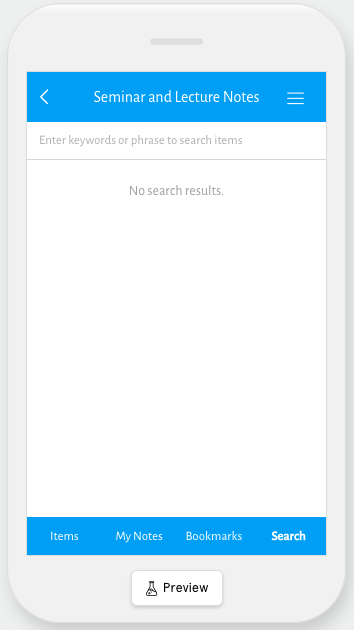 This will allow them to search throughout the feature for items with a phrase or specific name. When setting up an item, be careful to not make the background image too distracting as it can interfere with the legibility of the item's text. The Seminar and Lecture Notes feature is more versatile than one might initially think. We encourage you to come up with creative ways of using it outside of for seminars or lectures. 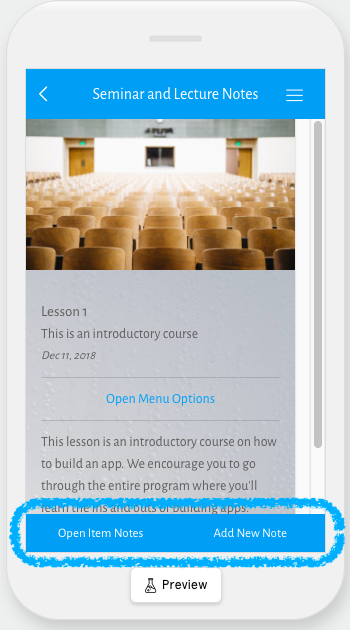 Just as an example, we have some apps sell premium content such as devotionals using the Seminar and Lecture Notes feature and in-app purchases. There’s a lot of great possibilities for the feature!